Habitat: Brazil. Cattleya nobilior is found growing on trees in gallery forests along rivers or on high cliffs in coastal Brazil. They experience distinctive wet and dry seasons with fluctuations in rainfall and humidity. Plant Size: Medium. Bifoliate. Cattleya nobilior is very similar to Cattleya walkeriana. Flower Description: The flowers of Cattleya nobilior are rose lavender in color and have a very distinctive lip with yellow diamond-shaped markings. The flower spike produces 1 to 3 flowers. Unlike other Cattleya orchids, the flower spike develops from the base of the pseudobulb rather than a sheath on top of the pseudobulb. 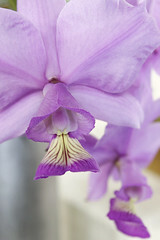 Additional Information: Cattleya nobilior is an unusual species worth collecting. There is a coerulea ("blue") form and an alba (white) form available.